In the epoch of professional T20 cricket leagues, the Indian Premier League has widely been accepted as the number one, in the midst of other leagues. It has been 11 years since its advent, and the cricket enthusiasts have seen some remarkable matches over the years. The franchises have played their level best on the field to rise victorious. Many match results have been decided on the final ball, and a few games have further gone into super-over. In this section, let us take a look at the best match of each IPL season from the inaugural season to 2011. The matches have been picked based on the excitement that the game produced, the importance of the game and fortuitous results. 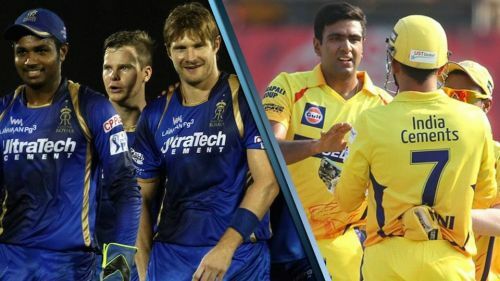 The most anticipated match of the first season was played between the Chennai Super Kings and the Rajasthan Royals at the prestigious Wankhede Stadium in Mumbai. The two sides had met twice in the tournament before the final, and the side from Rajasthan remained triumphant in both of them. CSK, after being put into bat by Shane Warne, scored 163/5 in 20 overs, on the back of Suresh Raina's 43 and Parthiv Patel's 38. The franchise from Rajasthan lost their in-form opener Swapnil Asnodkar early. The Royals lost three in quick succession in the chase and were reeling at 42/3. But Shane Watson and Yusuf Pathan got together to put up an excellent 65-run partnership. T20 veteran Pathan scored 56 to bring Rajasthan close to the target. The equation was minimized to 8 needed off 6 balls. CSK skipper MS Dhoni trusted Laxmipathy Balaji with the ball. The first three balls saw three runs coming from Rajasthan. The situation went down to one run from the last ball. Sohail Tanvir hit Balaji to wide mid-on and gave Rajasthan a historic win.